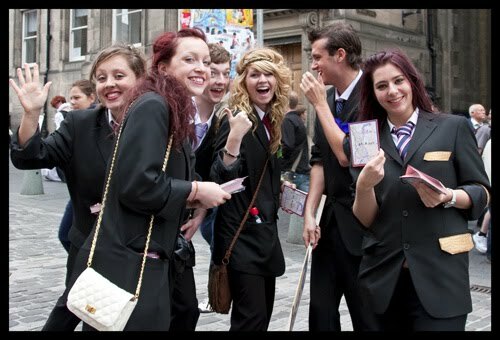 Edinburgh festival was fun, manic, crowds, too many shows and lots of colour! The book festival and the poetry reminds me why I do this and I met lots of fun people. Absolutely love it! This is my fourth trip to photograph the EIF. It changes each year and the venues move, yet the festival remains very much the same as it always has been since the forties that I grew up with. The street performers seem more colourful and professional and there is more photographers now. As I walked past some colourful graffiti I decided my trip this year would be about the colours and sounds of the festival. I immersed myself in the flurry of sounds. A taxi driver entertained me with tales of the 14 miles of tram track from the Ocean terminal to Saughton – he was not sure what it is for and the work is over six years in the building. Edinburgh puts on a good face though. As I crossed the wide barricaded path over Princes Street to the Mound Art galleries, I noticed the rest of the street is now dug up also. At the book festival I decided to have ice-cream with a flake and sitting on the wooden bench beside the central green statues, I felt a bit like Forrest Gump as I watched a dandelion wishes float up on the breeze. I watched Iain Banks having a photo shoot. I was not entirely sure why only this one photographer is taking the shoot. I had a chat with him and visiting the book festival and reading poetry reminds me of what inspires and motivates my work. The Broken Records Queen Hall gig Edge festival was an upbeat dynamic fun gig. Their music makes me feel on a rollercoaster: their songs move from slow to the adrenalin rush of the ride. The are led by two hot suave guys who are brothers and their cello, violin, and trumpet lend a distinct Scottish feel. Tuesday. I saw some shows today. Ihayami Indian dance which was graceful. Later a Brazilian show was vibrant, energetic and fun with extremely fit guys! Book festival – Raj Persaud and Mingus Campbell. While music gigs are my favourite thing, I get energy and colour from the dance. There was a wealth of events going on and it is a good idea to visit a few venues and pick up their brochures. Edinburgh is one of the biggest festival in the world. Mercy Madonna of Malawi. The Malawi actors, singers and dancers are excellent with their subtle rhythms. No easy answers here? I’m sure Madonna feels she is offering a child a chance of a better life. One answer is to improve the infrastructures and education. Venezuela Viva! With energetic salsa flamenco… offer all the sunshine colours. If you enjoy hot babes, this show is a definite must! The Highstreet entertainers: Sadly no Martians this year. Maybe this is a year of creativity rather than performance. Being creative is a wonderful gift and if you believe you have something to offer it’s worth it – I hope! *Check out my new Dance gallery and Edinburgh festival 2009 gallery.